Going dairy-free is a big deal for most of my clients. In fact, it’s almost a deal-breaker for a lot of people. I can’t tell you how many times my conversations with a new client have come to a screeching halt when we start talking about giving up dairy for awhile. And no wonder — the casopmorphins from cheese (which is actually a form of concentrated milk) cause an opiate effect in the body. This can actually reduce pain in the body, and give us those happy cheese vibes. However, as with all things opiate, cheese can be biologically addictive. So what’s so bad about being addicted to Greek yogurt, or cheese for that matter? The reasons are many, I’m sad to report. What About Raw/Small Farm Dairy? Whether I’m working with clients on a group detox or through 1-on-1 coaching, I encourage them to try eliminating dairy for 2-4 weeks. I encourage them to focus less on giving up dairy forever; instead, thinking of it as a temporary break. Often, clients find this one simple change helps with weight loss, and the reduction of abdominal bloating. Clients with acne or breakouts often notice their skin clears up as well. I’ve even had clients report a reduction in joint pain. A chance for clearer skin? Less bloating? Better success with weight loss? Definitely worth giving up the cheese-and-crackers or yogurt cups for a few weeks, right? After all, it’s just an experiment. It doesn’t have to mean forever. Unless you see enough positive changes that you want to make dairy-free your new default setting. Which is what happened for me. One of the simplest ways to go dairy-free is to swap out nut or seed milk for your regular milk. If you love yogurt, you might also try coconut-based yogurt. I also encourage you to start researching simple dairy-free recipes that offer creamy textures and flavor, without dairy’s extra baggage. All of the recipes that you’ll find here on my website are deliciously dairy-free. 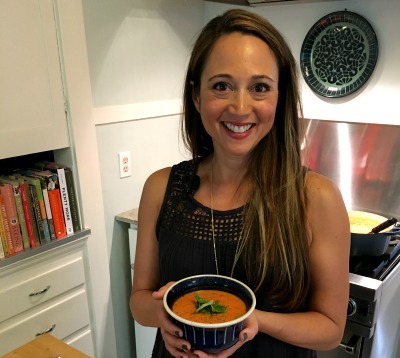 One of my favorite dairy-free recipes is for my Creamy Tomato Soup. It was actually inspired by the Pioneer Woman’s Sherried Tomato Soup, which I used to make before dairy-free became my new default setting. In this recipe makeover, I substituted a simple cashew cream for the regular cream, and I use Better Than Bouillon’s “No Chicken” base to keep things plant-strong. I also use double-concentrated tomato paste for deep tomato flavor. To check out the recipe, simply click on the links below. 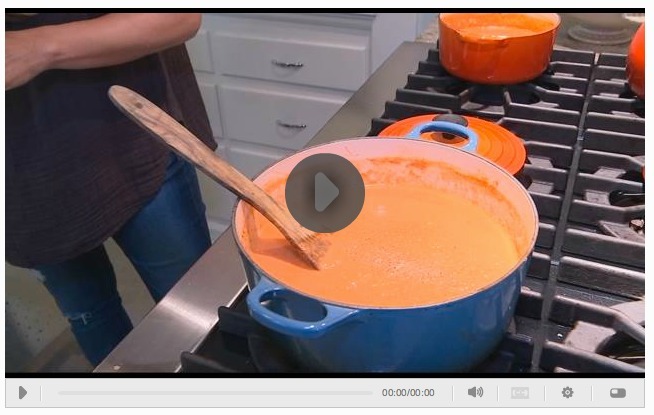 You can also watch me make the soup on the More Good Day Oregon clip below. My healthy living segments run about once a week. Happy (dairy-free) cooking — I hope you enjoy the soup!